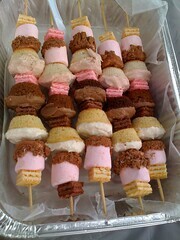 These cupcake kebabs (also known as Kebobs) are from Cupcakes take the cake. The cupcake kebab trend kicked off in the USA, and currently there are a lot of different versions on Flickr. 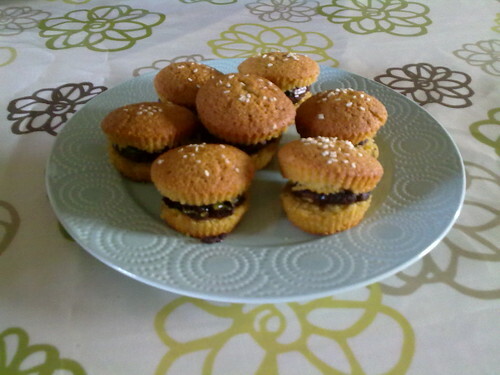 These ones consist of mini cupcakes, chocolate cornflake cakes, and mini wafer cakes. 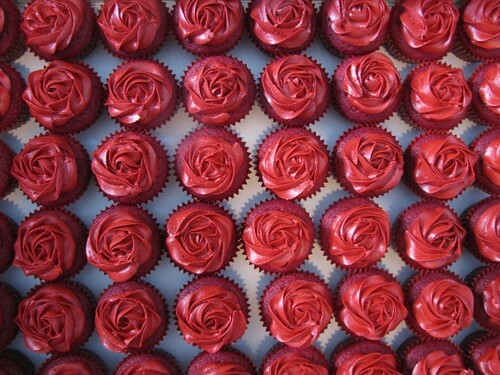 Pretty sure these were result in a serious case of sugar overdose, but they look gorgeous. Another popular trend at the moment is for rainbow cakes like this one (right) from alicia rae. The cakes are created by adding food colouring to several different batches of cake mixture and then adding a spoon full from each mixture into the cupcake case. Perfect cake for any 80s ravers. Finally, if you love cupcakes, you’ll love the trend for really massive cupcakes! Recently a couple of cupcake companies have attempted a world record for the worlds largest cupcake. In Covent Garden a couple of weeks ago, a giant one (left, image courtesy of Bitchbuzz) was presented and slices given out to the public. A cupcakery also attempted it in the Minneapolis Mall of America this week. Fancy making your own giant cupcake? Try it at home with this giant cupcake tin.